Most people experience some form of bloating after eating at some point in their lives, particularly those who have problems digesting certain foods. The gas that builds up as a result of eating hard-to-digest foods can produce the sensation that your abdomen is tight or full -- a sensation many people refer to as bloating. 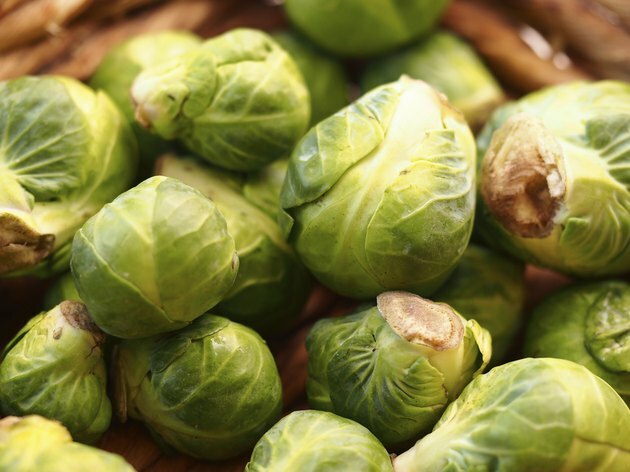 Brussels sprouts are a common cause of gas, and for some people, eating them can lead to feeling bloated. Avoiding brussels sprouts or taking digestive supplements usually does the trick in getting rid of gas and bloating. In some cases, however, eating brussels sprouts causes bloating due to an underlying digestive disorder. Increased gas in your intestines is usually due to either swallowing air or the result of bacteria breaking down foods in your large intestine. The gas exerts pressure on your intestinal wall and can produce a variety of symptoms, including bloating. Other common symptoms of gas include abdominal pain, nausea, burping and flatulence. Although some foods are naturally harder to digest than others, not everyone will experience noticeable gas or bloating when consuming them. Brussels sprouts are a common cause of gas and bloating because they contain a complex sugar called raffinose. Human beings lack the enzyme in their small intestine that helps break down the raffinose, which means it gets transported down to the large intestine for digestion. Bacteria in the large intestine help break down the raffinose, but it creates a lot of gas in the process -- a process that can easily lead to bloating and flatulence. Other foods that contain raffinose include beans, cabbage, asparagus and broccoli, all of which are commonly associated with gas symptoms. Avoiding brussels sprouts is the easiest way to prevent gas and bloating from forming if you have problems digesting them. If, however, you enjoy them too much to give them up, a digestive supplement may help. Supplements that contain the necessary enzyme, alpha-galactosidase, break down the raffinose before it gets to the large intestine, reducing the levels of gas and potentially avoiding bloating. Taking a supplement that reduces the overall level of gas in your intestine, such as simethicone or activated charcoal, may also help. Bloating after eating brussels sprouts is most often due to the raffinose content, but in some cases the bloating could be the sign of a functional gastrointestinal disorder, according to the University of North Carolina Center for Functional GI and Motility Disorders. Common problems that can lead to bloating include dyspepsia, irritable bowel syndrome and functional constipation. It is possible that eating brussels sprouts is simply exacerbating the condition. If you experience bloating consistently after eating brussels sprouts, even after taking supplements, or you experience bloating with more severe symptoms, consult a doctor to rule out a digestive disorder.